Want to get started memorizing FAST? Try our Starter Pack. 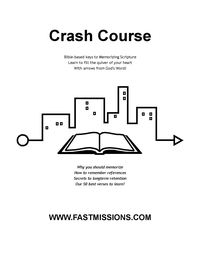 Includes our Crash Course in Bible memorization with great tips on how to memorize effectively. 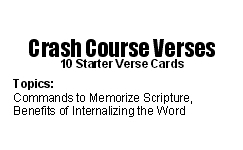 Plus, a verse pack and 10 printed verse cards great for those new to memorizing. Also a few blanks cards--so you can choose more verses of your own. Everything you need to get started. A great gift idea for friends and loved ones. $4.00. Click here to see more Memory Packs.